Since 2004, HABESHA has taken over 100 youth and adults to Ghana as a part of the Black To Our Roots program. During that time, a special relationship has grown between the village of Liati Wote in the Volta Region of Ghana near the Togo border. During our 10th Anniversary journey in 2014, the village leadership urged us to become more than visitors, but to be a part of the family and make a home for ourselves! 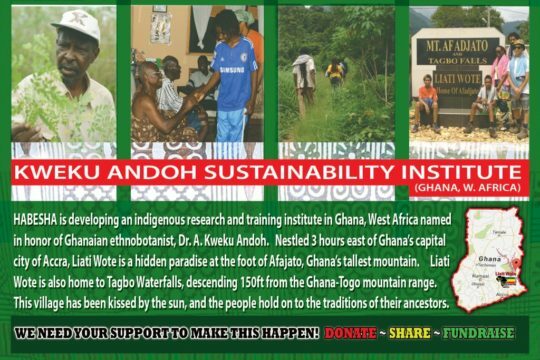 We have accepted the challenge, and embarking to develop a research and training institute that will be a hub for the sharing of indigenous African knowledge around sustainable living. 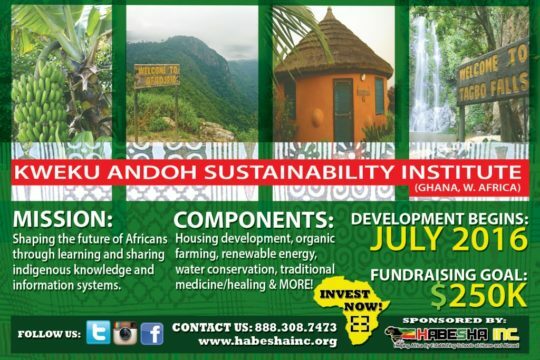 The Kweku Andoh Sustainability Institute (KASI), named in honor of world-renowned Ghanaian ethno-botanist Dr. A. Kweku Andoh, will provide a sacred space for researching the ancient traditions of housing development, holistic healing, and agricultural techniques utilized in the HABESHA Works training curriculum. Additionally, KASI will serve as the International Headquarters for HABESHA to host individuals & groups for African cultural exchange. YOU CAN SUPPORT THIS PROJECT IN A VARIETY OF WAYS! PRAYERS AND POSITIVE AFFIRMATIONS FOR PROJECT SUCCESS!